This was our first official family vacation. It was also Dawson's first plane ride! Orlando was about 90 degrees every day. which I think was Dawson's favorite part of the whole trip. and planned activities every night. Dawson got to pie his dad in the face one night. We were about 10 miles from the resorts. Our Villa was perfect in every way. and lunches at whichever park we were visiting for the day. We made it to every park but certainly didn't get to do everything. so we only stayed 1/2 day because they closed down all the rides. We got to the front of the ride lines with Dawson's golden ticket. and was hamming it up in another attraction too. Ariana got chased by Darth Maul. to the front of the line to take pictures with Chewbacca. 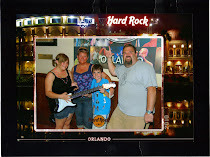 We got to eat at the Hard Rock cafe and get a souvenir cup. We took the Ferryboat and ate at little Germany in Epcot. and Give Kids the World for making it all possible. Our trip to Florida was fabulous. If I can figure out how I will post pictures. Most importantly Dawson had fun. That will be a whole other post. I quit my job at Wescor. I'm not sure what the breaking point was for me. My nervous breakdown or the job itself. I went back from my sabbatical part time and loved it. Then I realized I needed out of that environment. So I got a new job at GBS benefits. I'm official. I have a title. The gals I work with are fun, kind and generous. We get along great and have a lot in common. Shouldn't all work environments be like this?? I hope I can live up to their expectations. I'm an old dog and it's hard to learn new tricks.